I am cautiously excited. As I have committed to this process I am a bit nervous that I won’t “take notice” of something unique in my day, something that somehow made me grow, or inspired or … well you get the idea. I am blessed in that I am aware of the fact that I do not need to be this a life altering project on a daily basis; I only seek to raise my consciousness and I suppose that in and of itself has the potential for being life altering. I am diligently trying to be patient with this unknown and just let it “be”. 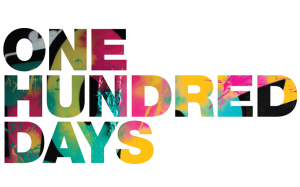 One hundred days is an effort to be present, be aware and perhaps even increase “self care”. My sister reminds me that you cannot get water from an empty well. If I wish to continue to serve, I need to fill up the well. I did just that. Rarely do I EVER take the time to read anymore. Working two full time jobs (school and Create Art 4 Good) leaves very little time for a moment to read or heck even do my laundry. But I did IT! (not the laundry, the self care) I not only took the time to read a few chapters of a book that is in no way art or business related, I took a nap. It wasn’t a long nap, but still it was a nap! I am grateful and even a bit more rested. Day one is down- on to day two.